I have created two identical saves, both of the players will start at Everton and this will be done over two years. The saves will not be at the same time, like the last version but more parallel universes. The striker with the 17 finishing is named DTG High and the other striker with 10 finishing is named DTG Low. 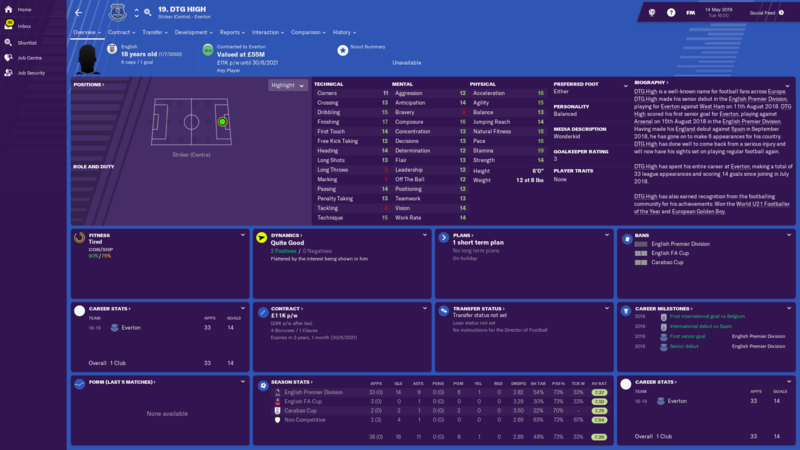 I also have a spreadsheet which is keeping track of the players attributes, as they are both set to 18 year olds with high potential and ‘wonderkid’ status. I wanted to put them at Everton because not only do I support them, they also lack a real goal scoring striker, so it fits perfectly. It means there is less competition and more chance of game time, for both strikers. 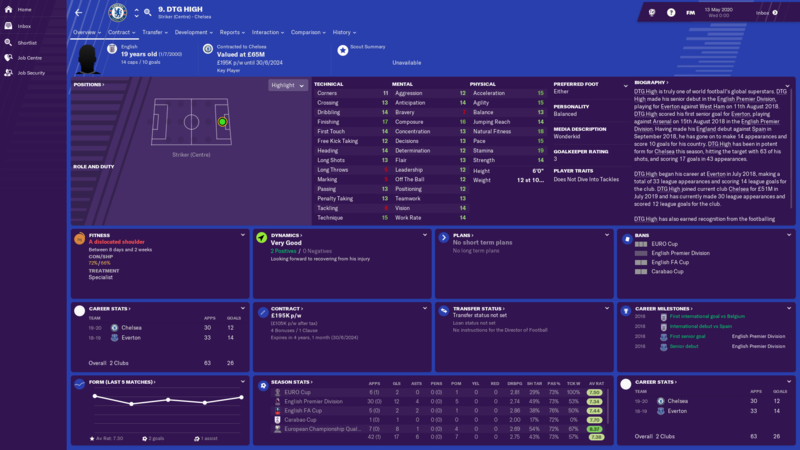 In this experiment I am hoping to find out whether striker should be the single most important attribute to look for in a striker. Before I created this experiment, like mentioned, it is the single most important attribute for me and the other attributes take a back seat when it comes to finding a perfect striker. Firstly, just to show you the players at the beginning of the save so you can see the differences. As you can see, the only difference is the random photo it has added to DTG Low and the finishing ability. What I am expecting to see is both strikers getting game time, but the player with the high finishing attribute to score a considerable amount more. What else do you expect from an experiment like this, surely it can’t be any different? Lets find out. Despite breaking his wrist and being out for six weeks, the high striker has done extremely well with his goal scoring record. The striker finished a few goals short of the top three, with Aguero, Salah and Deeney scoring 21, 20, 19 retrospectively. It terms of personal achievements, he was named Everton’s best player and best young player. As well as that he was named World Under 21 Player of the Year and European Golden Boy – what an achievement. This wasn’t enough to stop Marco Silva being sacked though, and during the Summer Everton are in search of a new first team manager. As a first season in the Premier League these statistics are impressive, and with the Euro’s coming up during the summer it could be interesting to see whether he plays more for England. What else is interesting is that Man United, Man City and Chelsea are interested in the player. I wonder if he will stay at The Toffees? Well, I wasn’t expecting this, that’s for sure. The striker defeated my predictions and actually went on to score one less goal in two more appearances. He also suffered a small injury, which kept him out of action for four weeks. He out performed the higher finisher internationally as well, which is interesting. The Low striker also won European Golden Boy, where Marco Silva was sacked (again) and Vincenzo Montella manager has took over at the end of the season. Everton finished 11th and only Harry Kane had more player of the match awards (11) than DTG Low (7). The low finishing striker has outperformed my expectations and could be in for an interesting summer with Man City, Arsenal, Chelsea and Man United after the young English striker. Now, this is where it will get interesting. Will both players move? will they go to the same club like last experiment (I hope not)? What has surprised me, is despite having such poor finishing for a Premier League striker he has a similar goal tally. Well, I was expecting him to move and he definitely has made a step up. He signed for Chelsea for £51 Million in July after a fantastic summer with the England squad. 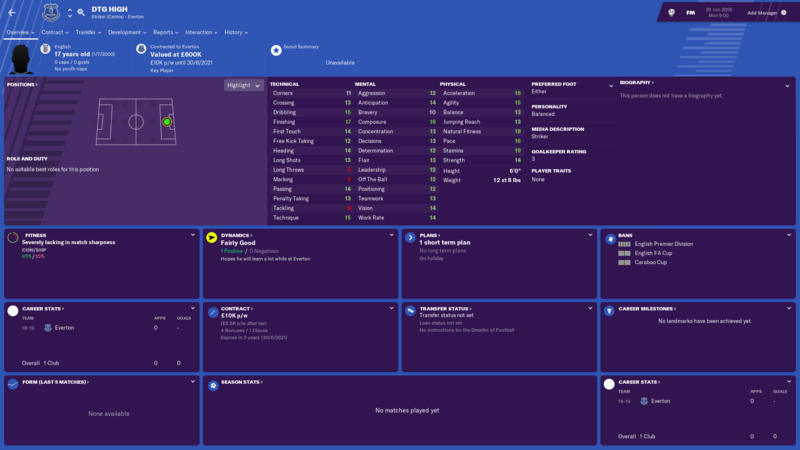 Although he didn’t score as many goals as in the first season, his season was cut short with an in game injury which has left him sidelined for the last ten games of the season. Chelsea made it to the Europa League final where they played Bayern Munich. They won 3-0, DTG High wasn’t fit for the final but that didn’t stop Chelsea winning it. He played in 49 games before being injured, so that in itself is an achievement to be proud of. Of course it happened again. Separate saves to avoid this sort of thing and it happens again. It’s actually made the experiment a bit more linear, because the exact same player just lacking in finishing has signed for the same club. At the end of this season DTG Low was nominated for World Footballer of the Year. He played more games than DTG High and scored more goals, but his average rating was lower than the Higher finisher. As I have set both players to have the same current ability as they do potential, it’s unlikely we will see any major changes to attributes, but the player value and statistics will be different. 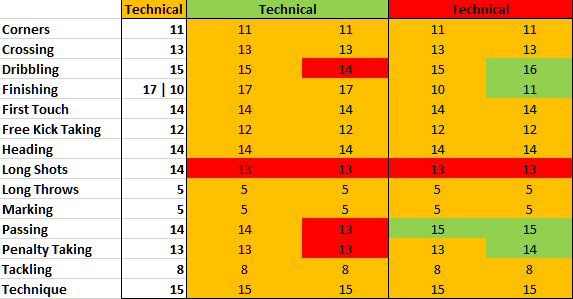 With the actual spreadsheet I have only included the Premier League performances in the appearances, goals and assists as it is the same playing field. You can, if you like, check the images that have been uploaded at the end of every season to see their statistics in other competitions. Comparing the two players is quite hard, because it’s a two year period and not a full career. The most interesting aspect, for me, is the appearances weighed against the goals he has scored. The Low player scored 1 more goal in 10 more appearances in the Premier League in ten more appearances, despite having a better shots on target ratio in both seasons and overall. As you can tell for yourself, it is very similar. Both players doing equally well, but if the 17 finishing played more, I would expect him to have more goals than the lower finisher. This is interesting, the lower finisher player actually grows. The high finisher doesn’t, if anything he drops off a little bit. It’s hard to understand why, but I believe the lower finisher is developing his overall game more to compensate for his lack of finishing ability. As we know, he has scored a considerable amount of goals over his two year career, so it’s not as if he can’t find the net. Looking specifically at passing, it has improved as the higher finisher decreased. Would this be down to the fact that because of the lack of finishing ability, the striker wants to bring in more players to phases of play? 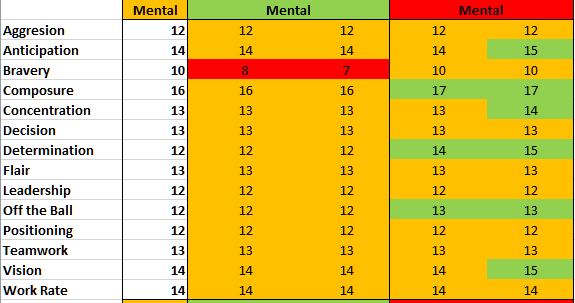 What surprised me most was the improvement of the players mental’s in the first season with low finishing. The player seemed to improve on this aspect of his game a lot more, in comparison to the 17 finishing striker. I wonder if the player knows he isn’t the perfect finisher, but is working more on other aspects of his play style to be an even bigger presence on the pitch. It is quite interesting that the player has improved compare to the 17 finishing player. In terms of the Bravery decline on the 17 finisher, I have no explanation for this, but it hasn’t jeopardised his performances and is consistently performing. Over both seasons, the low finisher improved a lot, which makes me think about his overall play style and the improvements and benefits it has on the team. Again, slight improvements to the low finishers overall game. I believe he is developing in to more of a complete player where the 17 finisher is almost the finished product. I am surprised with both players development, as they are similar, but one is growing, the other isn’t. Both players are contributing and becoming world recognised stars, and it’s fair to say the higher finisher is doing better with his personal achievements. But having ten finishing hasn’t stopped the other player from performing and doing equally as well. 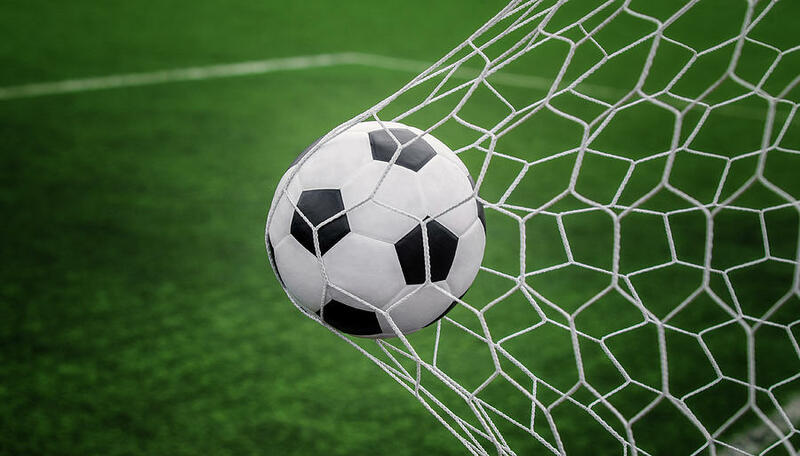 The shots on target percentage is 55% for the low striker and 43% for the high striker. I believe this is because the higher striker has the natural goal scoring ability, where as the low striker hasn’t. Looking at this in a little more depth, it has also meant the low striker has developed his decisions which has ultimately helped. Not shooting unnecessary and more picking the right option at the right time. In the first season the lower finisher had a better shots on target ratio than the higher finisher, which is a surprise. What the biggest surprise for me is how well DTG Low did with lower finishing. What we found out was that finishing isn’t the single most important attribute for a striker. This is plain and simple, and most people knew this, but would this put you off signing a striker with ten finishing? It certainly makes me wonder what can be achieved with players with the correct attributes despite being low on another attribute. I now will look a little less at finishing, and look more at other attributes. The growth of the less finishing striker was actually interesting, because you don’t expect that sort of growth compared to the other striker who is on paper better. I really enjoyed writing this, and finding all this information. 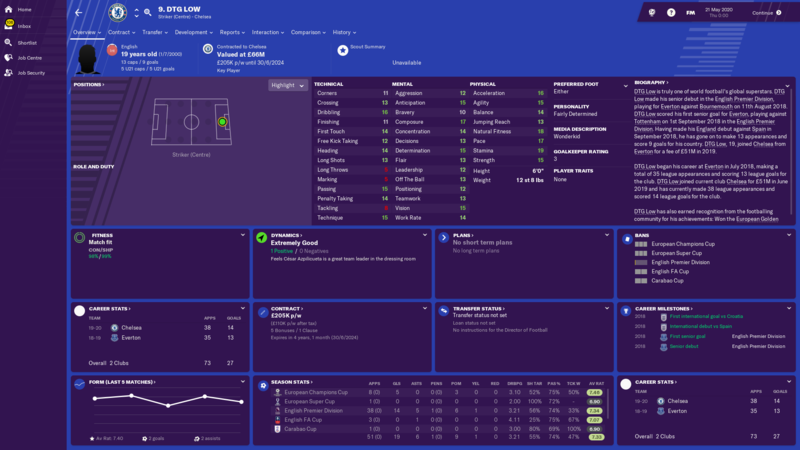 I for one wasn’t expecting this sort of result, and it’s definitely opened my eyes up to judging players on a variety of attributes rather than a single few. I will take this across to all my saves no matter the level, because it’s actually useful to know that you don’t need to be the perfect finisher to perform and do well. Practise makes perfect and at the end of the day, if a player with 10 finishing can score one goal less than a striker with 17 finishing then it’s not the end of the world and more of a chance to progress with the player.